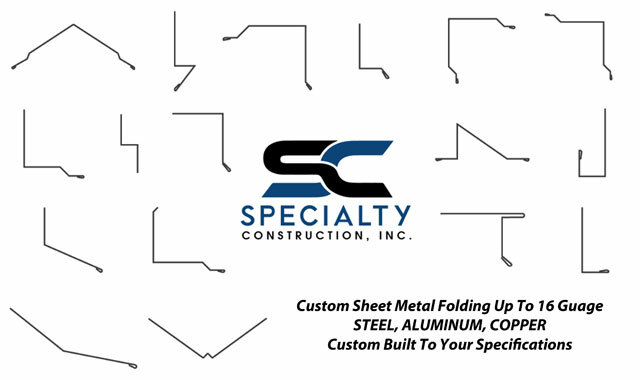 Specialty Construction Fabricates The Custom Sheet Metal You Need To Make Your Project a Big Success. 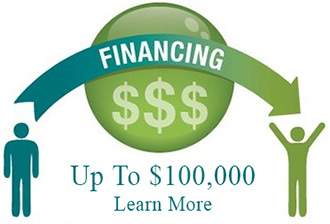 Call SC Today For a Fast Free Quote ! 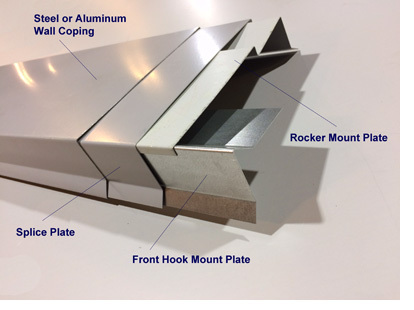 Specialty Construction’s lock tight Wall Coping System is a snap-on paint finished sheet metal system with no exposed fasteners. It includes a front-hook anchor plate and a rocker spring plate that provides a tight mount. Wall coping covers the entire wall edge and is commonly used on building parapets. 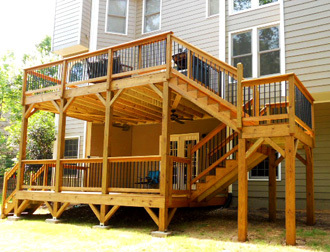 Specialty Construction can fabricate several types of metal coping systems, and provide project management and installation service if needed. The wall coping can either be sloped or level. 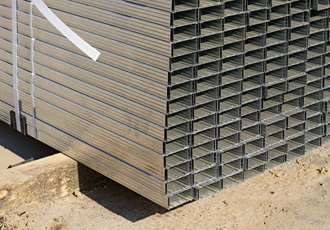 Metal wall coping can be fabricated from various materials such as aluminum, steel or even copper. Aluminum is the most common. 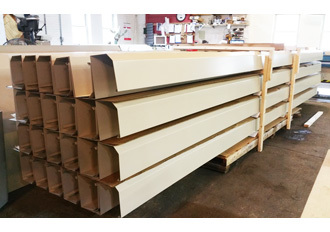 Specialty Construction’s sheet metal wall coping system is custom fabricated for the needs of each customer, and it provides for faster installation times than other forms of copings. 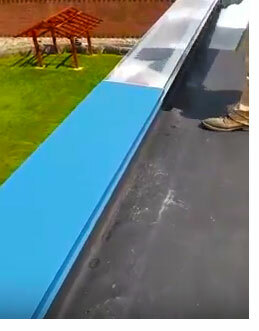 Sheet metal parapet caps fabricated in a variety of lengths and metals, and they can have a Baked Enamel paint finish that can be eligible for a 20 year paint finish warranty. The Front Hook Mount plates and Rocker Mount Plates together provide a spring-like action that results in a tightly locked down wall coping cap with no movement once locked in place. • Aluminum / Stainless Steel Mount Plates available. • Face extenders, custom miters and profiles available, customized to your specifications. 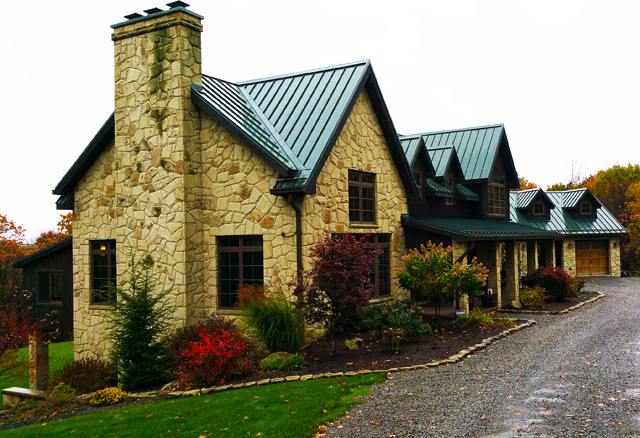 Some Homes Deserve a Stylish Metal Roof That Lasts Decades Longer Than Asphalt Shingles! The popularity of quality metal roofs continues to rise as an increasing number of homeowners discover the benefits that this type of roofing system can offer. Historically standing seam metal roofs were primarily used for commercial or agricultural buildings. Sometimes storage sheds would be covered with corrugated sheet metal, but using sheet metal on the roof of a home was certainly not common. 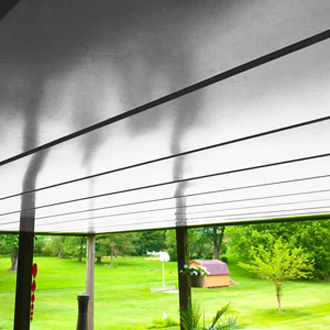 Fortunately today standing seam sheet metal roofs not only offer exceptional style for almost any home design, but they can provide a number of other advantages as well. For example, metal roofs offer energy efficiency and they are available with many different colored finishes so homeowners can choose the color that best suits their particular design preference. Contact Specialty Construction to learn more about a custom metal roof for your existing home or new construction. 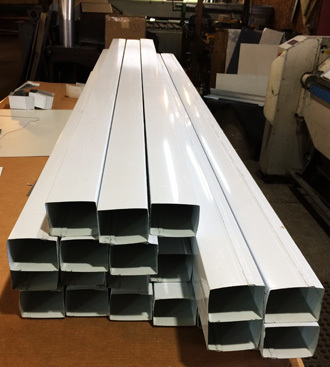 Custom Sheet Metal Work For Architects, Builders, And Homeowners Nationwide! SC’s Hook-n-Lock Wall Coping Install. Easy to Install and Securely Fastened for Life!